schmidt hammer lassen architects has completed the design for a unique new Cultural Home for the Labour Union in Ningbo, China. The 100,000 square metre project, known as the Home of Staff, was won by schmidt hammer lassen architects in an international competition in 2013. With an eclectic mix of functions, split across two separate buildings, the project is linked by a landscape park stretching over half a kilometre. The Home of Staff provides support, health, education, culture and leisure facilities for almost 3 million Ningbo Labour Union members. The Ningbo Labour Union has named the project the Home of Staff as they see it as a second home for the members they represent. 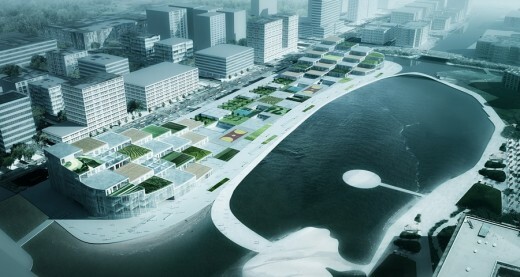 The project sits at the centre of Ningbo New East Town on the edge of a new ecological wetland area forming the new cultural hub of the city, including the New Ningbo Library, also designed by schmidt hammer lassen architects. The Home of Staff contains an impressive list of functions. It has arts and performance spaces, sports, leisure, education facilities and offices – all built on a base of commercial retail and exhibition space. The cultural functions of the building include a 3-screen cinema, a 1,200-seat performing arts venue, an exhibition hall, a Union Staff arts club and service centre, and training and learning facilities for up to 600 students. The sports and leisure functions include an aquatic centre with Olympic-size pool and large-scale wave pool, a full-size basketball court with spectator seating, 2 indoor tennis courts, 10 badminton courts, a fully equipped gymnasium and table tennis centre. Furthermore, the two buildings are linked with a series of retail courtyards and dedicated office space for the Ningbo Labour Union administration. The Home of Staff is expected to be completed towards the end of 2016, and is the third project designed by schmidt hammer lassen architects in the city of Ningbo. 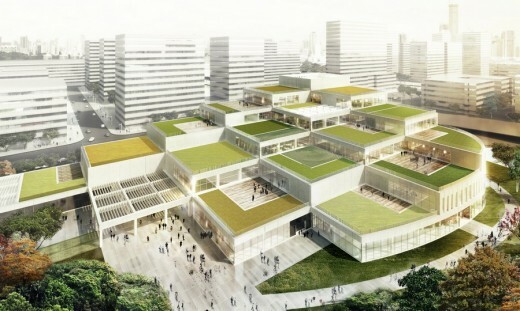 In December 2013 schmidt hammer lassen architects won the competition to design the 30,000 square metres New Ningbo Library, and in October 2013 the ground-breaking ceremony took place for the 123,000 square metres headquarters for Ningbo Daily Newspaper Group.